Raised just outside of Philadelphia, in Pennsburg, Pennsylvania, a boyhood dream of being a chef drove Chef Bryan Richard to fulfill this passion of the culinary world. Once out of high school, he began studying Political Science at Kutztown University. However his dream of a culinary career remained. With the unattractive future politics posed, Chef Bryan chose to make the shift into Culinary Arts, thus changing his life forever. After Kutztown University he continued his education at The Restaurant School at Walnut Hill College in Philadelphia, obtaining his Associate of Science degree in Culinary Arts. After graduation, Chef Bryan then honed his skills for the next six years in the Philadelphia area, working in places such as: The Valley Forge Brewing Company, Pistachio Bar and Grille, as well as other culinary endeavors. After moving to Savannah with his wife in 2001, he continued his career as Executive Chef of Tango Restaurant on Tybee Island. He was also Executive Chef of the Cobblestone Conch House in Savannah and served a short stint running the brigade at The New South CafÃ©. At Ogeechee Technical College, Chef Bryan strives to teach, lead, and inspire as an instructor of the new generation of food service professionals. Culinary students may become Servsafe ® certified after successfully completing the program class CUUL 1110 Culinary Safety and Sanitation. Students can also choose to become certified through the National Restaurant Association Educational Foundation (NRAEF) Managefirst program in the following areas: Nutrition, Cost Control, and Hospitality and Restaurant Management. Uniform/Knife Kit package is required beginning with CUUL 1000 Fundamentals of Culinary Arts. 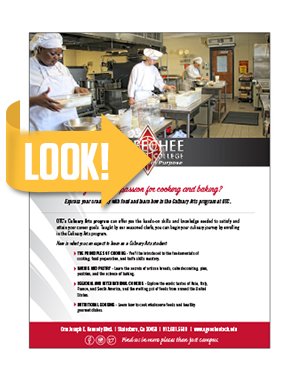 Students who are interested in certifications that are not offered through the Culinary Arts program, can find more information on the American Culinary Federation (ACF) website. The objective of the Culinary Arts program and its instructors is to ensure that our students obtain a comprehensive knowledge of the Culinary Arts. Upon completing the program, Culinary Arts students will be able to enter the food service industry with the necessary skills required to prepare food dishes, based on the standards set by the TCSG and the American Culinary Federation (ACF). The students gain knowledge through hands-on training coupled with lectures that parallel lab work. The Culinary Arts program ensures that the student are well-versed in such areas as pastry and bread baking, international cuisines, nutrition and menu planning, food service sanitation and safety, purchasing, garde manger and pantry, classical cuisine, American regional cuisine, front of the house service, and supervisory management, along with the history and professionalism of the Culinary Arts. Our students, through dedication and hard work, can aspire to become the next "Top Chef". 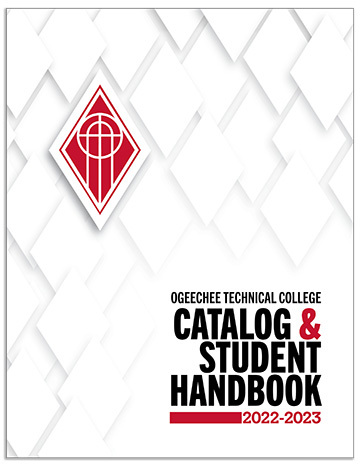 The Culinary Arts programs at Ogeechee Technical College prepare students for the culinary profession. Learning opportunities develop academic, occupational, and professional knowledge and skills required for job acquisition, retention, and advancement. The program emphasizes a combination of culinary theory and practical application necessary for successful employment including certification in food protection management. Graduates who are current practitioners will benefit through enhancement of career potential. Entry level persons will be prepared to pursue diverse opportunities in the culinary field as cooks, bakers, caterers or culinary managers.